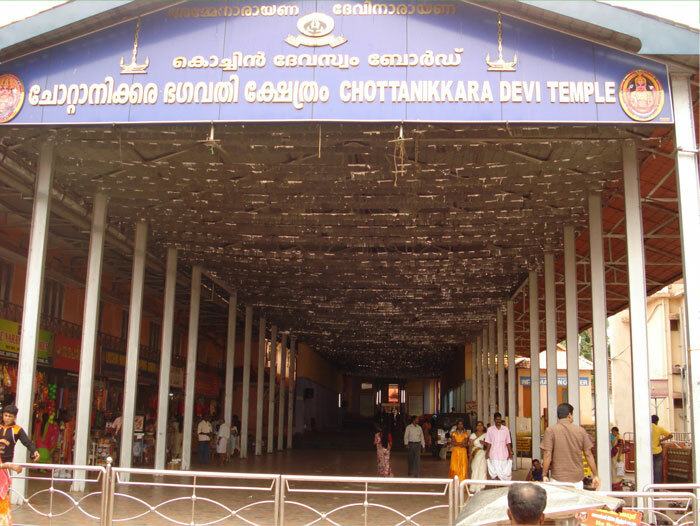 Chottanikkara Devi temple is located in Kochi in Ernakulam district. Raja Rajeshwari or the Chottanikkara devi is the deity here and exist in three forms namely Saraswathi, Lakshmi and Durga. In the morning Saraswathi is worn white colored dress, Lakshmi is draped in crimson color at noon and Durga is made to wear blue color dress in the evening. There are idols of Lord Vishnu, Brahma, Shiva, Ganapathy, Subrahmaniya and Shastha. Many stories are involved in the origin of the temple. According to the legend Adi Sankara after performing Tapas in the Himalayas was blessed with the darshan of goddess. He requested the goddess to come with him to Kerala to which the goddess agreed. But she had proposed a condition that he should not turn back on the way when the goddess accompanies him. But after travelling a long time, when the sounds of the anklets of goddess was not to be heard, Adi Sankara turned back to see the goddess. She suddenly turned into a golden statue as he had broken the promise. It is at this place that the famous Kollur Mookambika temple is located at present. Adi Sankara was very sad about this and begged the goddess for forgiveness. Saraswathi was melted by Adi Sankara’s prayers and told him that she would be present in Chottanikara in the morning so that he could meet her there. It is believed that the present statue of the goddess was discovered by Vilwamangalam. He had obtained the statue of Bhadrakali in Kizhakavu from a tank. This temple is famous for having miraculous powers for healing mental disorders. Mainly devotees from lower caste visit this temple with the belief that if they are possessed by some spirits, they would be cured. The persons who come with psychological cases get cured; it may be either due to their faith or the environment of the temple. It is the chief priest who performs this ritual. He enters into a conversation with the patient and then orders the spirit to get out from the patient’s body. There is a Paala tree in the temple premise on which iron nails are hammered which indicates that the spirit had escaped from the patient’s body. The rituals that are performed here are all related to driving the spirits. The famous ritual is the ‘Guruthi Pooja’ which should not be missed. The offerings made to the goddess include Neem leaves, lime fruits etc which are taken home and hung at the corner of the house. This is believed to drive away any evil spirits. The main festival conducted here is the ‘Chottanikara Makam thozhal’ which is held in the Malayalam month Kumbham. It is believed that the goddess has given darshan to Vilwamangalam on the Makam day and that she would give darshan to all the devotees also on the same day each year. Some other festival celebrated here include the Thiruvonam feast conducted to all the devotees in the Malayalam month Chingam, Navarathri Agosham held in the Malayalam month Kanni, Vrishchika Mandala mahotsavam held during the Mandalam season in the Malayalam month Vrishchikam and the Ramayana masam celebrations.